Watch out for a water gun while peacefully floating around the lazy river. Spend some family time bonding with kids over board games. Luckily, your living room has enough space to accommodate your whole crew. To shoot down a water slide is equally fun for kids and adults. Enjoy the free park shuttle to Walt Disney World. The children's club and children's pool with waterslide will be a big hit with the kids. 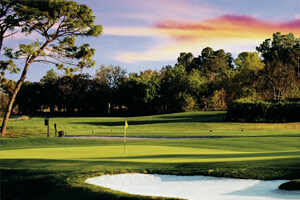 Brush up on your game at Orange Lake Golf Course, just a 10 minute drive away. A lazy river and water slides are just a few of the attractions at the onsite water park. Order a cocktail, appetizer or entree from The Springs Bar & Grill. Watch the sunset on your private balcony. The Grove Resort & Spa Orlando was built in 2017 and is conveniently located near the area’s best theme parks and attractions. Get your morning off to the right start with a visit to the on-site coffee shop for illy brand coffee and espresso. The main highlights of the resort are the pools: there are three outdoor pools to choose from (or hop between them all). Swim a few laps or grab a private cabana and relax with a refreshing drink from the poolside bar while the kids play in the children’s splash zone, it has a waterslide. But that’s not all! The Grove Resort features a full-service spa. Book a massage, manicure or pedicure; or go crazy and book all three (you are on vacation)! When it’s time for lunch, you have options. Take advantage of the poolside service and order food from the on-site restaurant or have a family cookout thanks to the BBQ grills. The Grove Resort offers several children’s and family activities such as arts & crafts, scavenger hunts, pool parties and dive-in movies. While the kids are occupied, head to the fitness center for a quick workout. Air-conditioned one- to three-bedroom condos sleep four to eight guests. Full kitchens have everything you need to make meals in your condo. The on-site convenience store, Alfresco Market, has basic groceries; for more variety, stop by the local Publix. Pick up some k-cups to use in your in-suite Keurig coffee maker. Back in your condo, bake a batch of your famous chocolate chip cookies and let the little ones help with the mixing. Did the kids end up covered in chocolate? No problem! There’s an in-suite washer/dryer. Flatscreen TVs have premium cable and are perfect for catching a sitcom rerun or the big game. If you are staying on a higher floor, you may be able to watch the Walt Disney World fireworks from your balcony! The Grove Resort offers a theme park shuttle to take you to Walt Disney World®. Disney’s most classic attractions can be found in Magic Kingdom®. Take a ride on the Walt Disney World® Railroad in Main Street. Fantasyland is where you will find Cinderella’s Castle, It’s a Small World and Dumbo the Flying Elephant. Get ready to party at the Country Bear Jamboree, in Frontierland. Explore Tom Sawyer Island or ride Splash Mountain. Join the nine-hundred-and-ninety-nine happy haunts in Liberty Square’s Haunted Mansion. Next up, Adventureland, where you can sing along with the birds of Walt Disney’s® Enchanted Tiki Room, go on a Jungle Cruise or ride Pirates of the Caribbean. SeaWorld® is the home of Orlando’s tallest, fastest and longest roller coaster, Mako. Visit Dolphin Cove, one of the largest interactive dolphin pools in the world. See five penguin species in the Antarctica: Empire of the Penguin Habitat. Universal Orlando® is a made up of two theme parks that are perfect for movie lovers. Ride through some of your favorite movies including Jurassic Park, Terminator, the Mummy, Despicable Me and Men in Black. Harry Potter fans may want to block out a whole day for The Wizarding World of Harry Potter® – it’s that big! Diagon Alley is where you will find Harry Potter and the Escape from Gringotts, Ollivander’s wand shop, and Flight of the Hippogriff. See a performance from the frog choir and ride Harry Potter at the Forbidden Journey in Hogsmeade.